What Should Value Mean for Your Dynasty Team? We all know the saying “One man’s trash is another man’s treasure.” Why? Well that old adage describes it all. Even at an early age it is clear to all of us that value can mean vastly different things to different people. Heck, value can even differ with the same person at a different time, or in a different circumstance. Professionals like real estate appraisers and stock brokers, spend the majority of their nine-to-five working to find accurate standardized values for their clients. The problem is value is fluid, and can be hard to pinpoint without deciding which factors should matter in an evaluation. With this understood it is easy to see how dynasty league mates can greatly differ in their opinions of their players. These differences in evaluations have massive effects on nearly every decision a dynasty league owner makes. Today, we’ll examine a few of the main factors you can account for to make informed decisions regarding dynasty player value. To be successful in a dynasty league it is necessary to study your league’s specific rules. Are you playing in a 2QB Superflex? What about a TE premium league? Standard or PPR scoring settings? These questions can go a long way in helping you decide how to value positions in your league relative to one another. For our purposes, we’ll examine a 12 man 1QB,2RB,3WR,1FLX,1K,1DST PPR League. 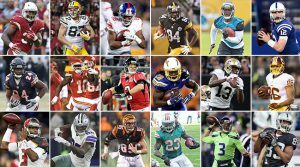 The justification for the Wide Receiver being ranked as the most valuable positional group in a dynasty league, is most notably tied to their potential for longevity. Generally drafted between the ages of 20 to 23, wide receivers likely peak in their age 26 seasons, and maintain their prime through the last game they play at age 29. Many top receivers still contribute well into their 30s, and can reasonably be expected to give owners a minimum of WR2 numbers, all the way out to their age 32 seasons. Larry Fitzgerald, a 34 year old receiver for the Arizona Cardinals, represents the extreme nature of this trend, as he continues to produce at a WR1 level well past his expected prime. Receivers also tend to have a lower risk for injury than their RB or TE counterparts, as they have an approximate 4.5% chance to sustain an injury per game serious enough to cause them to miss another. All of this information points to the fact that young, stud wide receivers are worth their weight in gold in dynasty leagues. NFL teams trotted 11 personnel groupings (1TE, 1RB, 3WR) an eye opening 59% of the time in 2017 per SharpStats. This allowed even the third wideout on a team’s depth chart to participate in over half their team’s plays, on a game by game basis. This abundance of opportunity is probably the largest factor in bringing receiver value down, as there are a large number of startable receiver options in any given week (36 in a 12 team PPR league). In addition to this trend, receivers tend to take 2-4 years to develop on average, highlighting the need for patience when drafting to fill this position group. Be sure to also proceed with caution if a receiver changes teams, as the general trend is that they tend to do worse in their new locations, than they did with the team they were drafted by. Running backs accrue their value mainly based on the scarcity of quality options at their position. In 2017 Todd Gurley, PPRs #1 RB finished with 383.3 points per FantasyPros. Le’Veon Bell, the #2 RB on that list, finished over 40 points (2 solid games worth) behind him. Worse still #12, Ezekiel Elliott (10 games played, 6 Suspended), finished with 203.2 points as the last viable RB1 in a 12 team league (180.1 points behind Gurley). What this data shows us is that the drop-off in RB quality is extremely steep as you go down the list. In our given scenario only 24 RBS (12 teams x2 starting RBs each) can reasonably be considered starting options in the dynasty league. Not getting one of these top 12 at the very least has an enormous impact on your ability or inability to contend. As a point of comparison, Amari Cooper WR#36 was only 151.9 points behind leader Antonio Brown. As fantasy football is at its core about points above replacement on a position by position basis, it is important to understand and internalize this trend. The downside for Running Backs is, their potential for volatility in their expected levels of production throughout their time on a dynasty roster. Injury risk for this positional group is an alarming 5.2% per profootballlogic. This injury risk places RBs firmly atop the list when it comes to their propensity to miss starts. RBs also don’t age as well as their WR, QB, and TE counterparts. RBs generally peak in their age 26 seasons and, in rare circumstances, can contribute RB1 numbers through their age 29 seasons. Exceptions like Frank Gore do exist but don’t represent the norm. Running backs are also more easily supplanted than their WR counterparts, as there often is only one spot for them on any given play. Two running back personnel groupings do occur, but not nearly at the same frequency as two or three wide receiver sets. As new blood is brought in the form of rookies, year after year running backs outside the elite few are constantly fighting to keep their jobs. For this reason, their value can fluctuate greatly from year to year. The Tight End positional group is another one marked by scarcity in terms of quality at the top. After Gronk, Kelce, Ertz, and maybe Engram, all other available starters can best be described as shots in the dark. TEs also don’t usually start to provide TE1 production until their age 25 seasons, and taper out after age 32. Though the drop-off isn’t as severe as their RB counterparts, the oscillating nature of their seasonal production makes them hard to trust year over year. Tight ends aren’t an extremely risky bet in dynasty leagues as they usually don’t come at a high cost. In most circumstances nothing more than a 3rd round rookie draft pick will be required to roster a top rookie TE. Going the veteran route is also an option as in all but the deepest leagues TE streaming is a usable strategy. However, like running backs, all but the elite TEs tend to get phased out of starting positions fairly frequently relative to their peers. The Quarterback position group scores the most points on a fantasy team and is a necessary component of a winning squad year over year. QB careers can span more than a decade and elite QBs like Tom Brady and Aaron Rodgers can be expected to contribute well into their late 30s/early 40s. QBs usually don’t peak until their age 27 season, and can maintain their peak much longer than any other position group. They are also relatively consistent scoring wise in comparison to their peers. As an added bonus, even league average quarterbacks rarely get injured (2.5%) and don’t need to worry about losing their jobs at a rate anywhere near any other position group. The Quarterback is as stable a dynasty asset as they come. If QBs are so stable why the low ranking you ask? Well it’s a simple case of supply and demand. In a 12 team 1 QB league, every QB down to QB 12 is immediately startable. If we assume every team grabs a backup, there should still be 8 starting NFL QBs not rostered in the league. Even more concerning, the difference between QB1 and QB 24 in 2017 was a mere 160.6pts. Based on this understanding, it is clear that this deep position group is the easiest group to stream in fantasy. Outside of the top 24, there are a number of QBs every year that provide high end QB1 numbers sporadically. Attentive owners will be able to identify these opportunities. An in depth analysis of kickers and DST isn’t necessary because of the bevy of streamable options. I hope you found this information useful and urge you to factor in these guidelines when making decisions about value in your dynasty leagues.